My two big dogs together are that weight (150-155)! We had - briefly! - considered a Newfie before we got Jax (Flat-Coat). My Flat-Coat likes to chew thru toys, too - have to be careful about what I give him to play with. Technically we did not give it to her. My son was playing football and she came up with an interception. Surprisingly agile and coordinated for the big oaf that she is. Wowser we have some beautiful pets coming through this thread. Thanks for showing off these beauties and keep em coming !! Figured I'd bump this thread up so more folks could add some pics of the fur buddies! Awwwww that is just tooooo cute!!!!! Do like the color coordinated outfits! My wife is a cat person, and feeds neighborhood cats. They DO NOT come into the house!! My brother-in-law lives across the street and doesn't like cats. He has mice. I have never seen a mouse at our house. 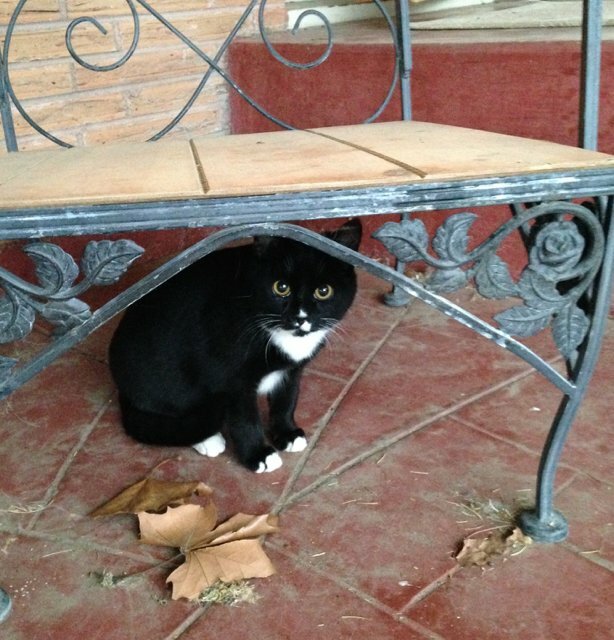 About a month ago before our cold snap, a black cat with one kitten showed up at our patio. Very wild. Couldn't get near them. This happens all the time; some stay for awhile, then move on. After a few days, only the kitten showed up. Then the cold snap came. My wife put out a little "cat house" with a heater in it, but the kitten never used it. My wife took this picture about a week ago (kitten has grown a lot since it showed up), and posted it on FB. A couple fell in love with it, and came this last weekend to pick it up. In the few days after this picture was taken, and before the couple showed up, you could pet it, pick it up (purrs constantly). It now has a nice warm home. Beautiful pups .. appear to be well-trained (can I hire you? ). 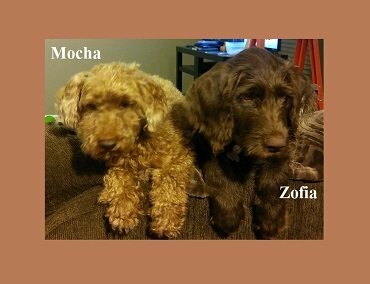 Mocha 11 yr old poodle and Zofia (Zofi for short) 4 Month old Labradoodle (in this first picture) about 25 lbs at the time. In the 2nd, will be 7months old on Xmas Day. 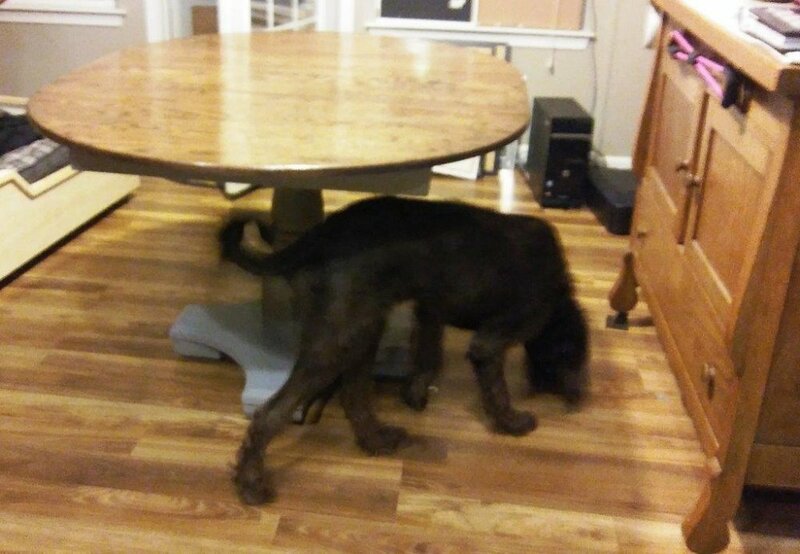 About 60 lbs now and her back almost touches the table. She sits next to the table resting her chin on it watching us while we eat. She is very smart but, also wild and crazy!! My Evnroll putter testing gets interrupted as Polly gets a little action on the green. Note: There is a ball under her paw and she is a polydactyl (5 toes on each paw). Just saying I think my dog loves me..
That's great! It looks like the feeling is mutual. 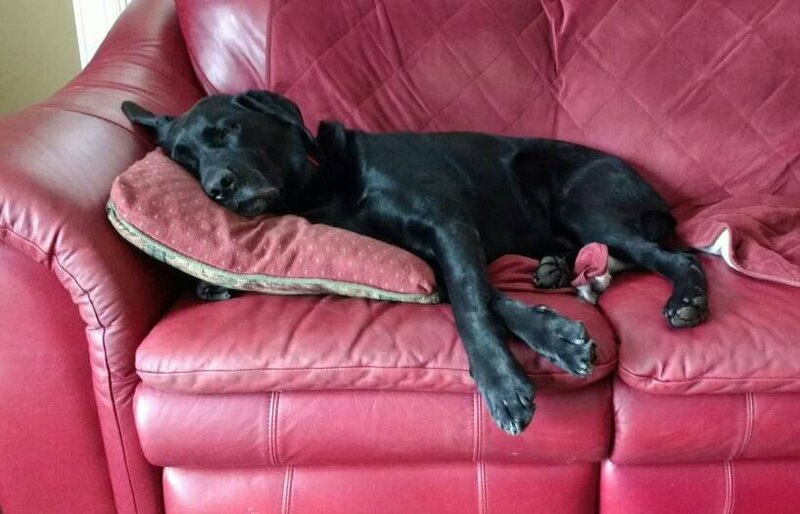 Play hard, then hit the couch!